Researchers have developed a new method to analyze metalloproteins with only a tiny liquid sample. This breakthrough was achieved by a research team led by Associate Professor Eiji Ohmichi and Tsubasa Okamoto at the Kobe University Graduate School of Science. The findings were published on November 28 in Applied Physics Letters. Metalloproteins (also known as metal-binding proteins) play vital roles for oxygen transport and storage, electron transport, oxidation and reduction. In many cases, the metal ions in these proteins are the active centers for these activities, so by identifying the exact state of these ions, we can understand the mechanisms behind their functions. An experimental method called electron paramagnetic resonance (EPR) can be used to measure the state of electron ions in proteins. Effective EPR techniques require a certain amount of specimen volume for sensitive measurements. However, many metalloproteins are difficult to isolate and refine, so researchers can only obtain small samples. Conventional EPR measurements detect the electromagnetic waves absorbed by metal ions. 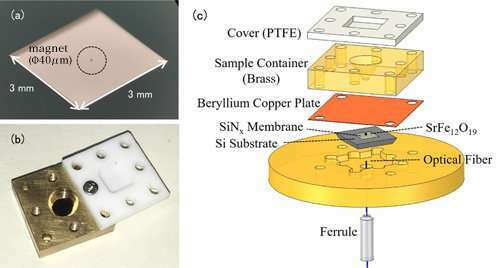 The notable feature of this study is the use of a trampoline-shaped device called a nanomembrane (figure 1(a)). In EPR, the electron spin transitions to a high-energy state by absorbing electromagnetic waves, but at the same time, the spin direction reverses, and the magnetic properties of the metal ions also change. Before the experiment, the research team attached tiny magnets to the nanomembrane, so the changes in the force of attraction between the magnets and the metal ions are transformed into a force on the nanomembrane, and this EPR signal is detected. Since the nanomembrane is very thin—just 100 nm (=0.1 μm) we can sensitively measure small changes in force that accompany EPR absorption. The solution specimen is placed in a solution cell directly above the membrane (figure 1(b)). The cell volume is just 50μL (=0.05 cc), and the team adds about 1-10μL(0.001-0.01 cc) of solution for measurement. In order to prevent the solution from evaporating, the cell is covered with a resin lid. In this method the thin and fragile nanomembrane is independent from the solution cell, making it easy to switch specimens (figure 1(c)). 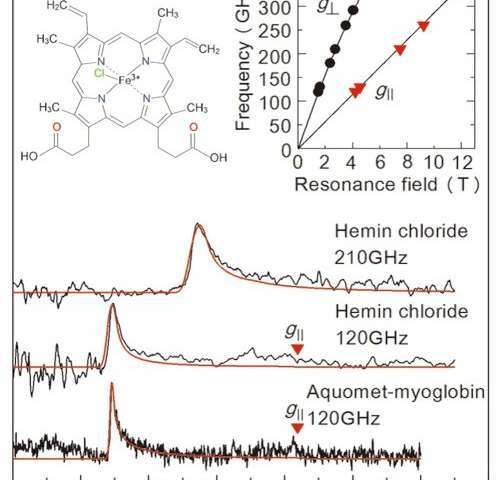 In order to evaluate the performance of this setup, the team carried out EPR measurement over a high-frequency (over 0.1 THz) for an iron-containing protein called myoglobin and its model complex hemin chloride (figure 2). The team succeeded in detecting EPR signals across a wide wave frequency (0.1-0.35 THz) for a 50 mM concentration, 2μL hemin chloride solution. They also observed a characteristic EPR signal for a 8.8 mM, 10μL specimen of myoglobin solution. A great advantage of this method is the ability to measure across a wide frequency range, making it applicable for metalloproteins with a variety of magnetic properties. Professor Ohmichi comments: "This new method makes it possible to determine to a detailed level the state of the metal ions in a tiny amount of metalloprotein solution. We may be able to apply the method to metalloproteins that previously could not be measured. For example, in our metabolisms, a metalloprotein called peroxidase plays a crucial role by converting hydrogen peroxide into water, making it harmless, but the details of the mechanism for this reactive process are still unclear. The results from this study can potentially be applied as a leading analysis method to shed light on this sort of vital phenomenon."